We have posted the entire text and most of the photographs. We will also, over time, provide discussion and additional information and images, interviews, etc. This entry was posted in Gwenmar, Recent by admin. Bookmark the permalink. Sadie and William moved out to the Okanagan Valley, B.C. about 1920. I checked my Mom’s birthday in R.K.’s diary and he mentions a baby girl born to Sadie !! how exciting to see that !!! How interesting to find a relative like this! “RK” was my father’s father, of course, and I’ll admit that it was a relief to find that a Smith could marry someone other than another Smith ! (RK and then my father). I DO remember dad talking about cousins Sadie and Eunice and he may have visited them after Sadie moved to B.C. but people didn’t travel in those days and of course money was a factor so he may not have. I don’t have anything but your e-mail address so it would be nice to know where you live and a bit about your family, etc. You may know that my cousin Carlyle Smith’s wife Mary Jane has done a lot of sleuthing into the Smith family and knows a lot about all the connections. You may know more than me (i.e. 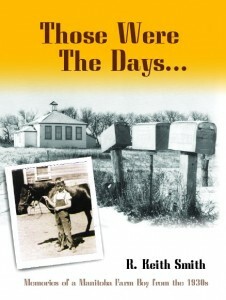 about me) if you have accessed my memoirs “Those Were The Days”. I have been working on my memoirs and ran across your website while searching for references to Curly Heapy. I find we were classmates in Grade 12 at Oak Lake; I was from Kenton and boarded at Mrs Gibbs. Mr Heapy was indeed, a great teacher. Noting my interest in Science, he was instrumental in my obtaining an Isbister Scholarship, so I was able to attend Brandon College for the next 3 years; I graduated with a Bsc. degree in ’52. I have not read all of your book and would like to get a paper copy, but don’t know how to do this. I checked with local libraries, but they have no listing. Maybe you can help?